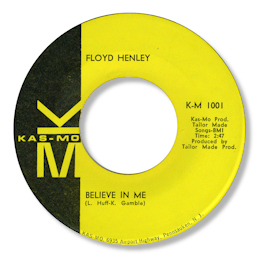 Floyd Henley's only release that I’m aware of though is the excellent Believe In Me which is one of those tracks that some people would call sweet and others deep. Whatever bag you put it in though, there’s no doubt that about the fact that it was cut in Philly - the musicians who came to be called MFSB are quite unmistakeable – despite the Pennsauken address of the label, even if you didn’t notice the Gamble/Huff writing credit on the label. What’s also undeniable is the beauty of Henley’s high baritone – wonderful purity of tone too. Henley sadly passed away on 12 March 2012 aged 71. UPDATE ~ Martin Scragg has kindly written with more info on the Kas-Mo release. "The Kas-Mo single was picked up by the Amy/Mala/Bell group, and reissued as Kas-Mo 22,001, with new matrix numbers 8706-BW and 8707-BW. All the rest of the labels are identical to the earlier release." I'm grateful to Martin for sending this info. Note - The Floyd Henley who recorded with the Gospel Echo-Ettes in Detroit and on Ri-Cath in New Jersey is a different artist. Thanks to my great friend Greg Burgess for the suggestion and the info.